Woldemar Bargiel was the half-brother of Clara Schumann, and given his interest in music, it is not surprising that he became part of the Schumann circle. His compositions were described as pale copies of the great composers, including his brother-in-law, which is perhaps unkind but not entirely unjustified. His later works resist the pull of the late-Romantics, such as Mahler and Strauss, looking to Brahms and back to Beethoven, Haydn and Schubert. My first encounter with his music was fairly recent, as part of my survey of piano trios. Trio Parnassus have recorded his three piano trios on two MDG CDs, which are now difficult to obtain. You can obtain readily them as downloads, but they do not come with a booklet. I am generally resistant to this situation, especially where the composer is little known, but the samples of the trios that I heard were sufficiently encouraging to persuade me into a purchase. As far as I can tell, this is the first review on this site of Bargiel’s music. 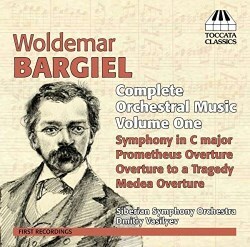 The Prometheus overture was written while Bargiel was studying at Leipzig Conservatory. There is little doubt that it owes much to Beethoven’s similarly named overture, though Liszt’s tone poem Prometheus may also have had some influence. At over eighteen minutes, there is no doubt that it stretches its material too far, but it does have some splendid melodies. The orchestration is not as interesting as the other works presented here. The premiere of Overture to a tragedy was conducted by Bargiel’s teacher, Julius Rietz, and led Hans von Bülow to write “Bargiel can claim the highest rank among Schumann’s followers after Joseph Joachim”. It was originally titled Overture to Romeo and Juliet, but changed before publication because it simply doesn’t have the emotional depth suited to the play. It has stylistic links to Schumann’s Manfred overture, but is a fine work in its right. The Medea overture was his big success, with numerous performances around Germany and further afield, and led to his appointment as director of the music school in Rotterdam. The booklet links it to Schumann, though I more hear Mendelssohn. It builds from an ominously quiet opening into a series of increasingly dramatic surges, separated by short darkly lyrical moments. Personally, I prefer the Overture to a tragedy, but I can understand why it was so successful in its time. The Symphony, with the exception of the second movement, is very much a case of “spot the influence”. The first movement, is very, very Beethovenian: imagine a blend of the fifth, sixth and seventh symphonies. Some of the melodies sound as though they are direct borrowings. The slow second movement is fortunately more original, though it does include what could be construed as a funeral march. It has a number of quite beautiful melodies, and some very appealing orchestral colours from the woodwinds and horns, and I thoroughly enjoyed it. The Menuett that follows might be mistaken for an abandoned Schubert piece, while the final Allegro molto owes much to Haydn, though as reorchestrated by Beethoven. Lest I sound too critical, it is worth bearing in mind that Brahms, only five years younger than Bargiel, had not completed his first symphony by this time, and when he did, there was obvious homage to Beethoven in it as well. In its early days, Naxos was known for using journeyman orchestras from eastern Europe, but even they didn’t go as far as Toccata has done recently, with a number of recordings based in the Siberian city of Omsk. The orchestra goes by two names: the the Omsk Philharmonic Orchestra at home (and on their website) and the Siberian Symphony Orchestra abroad. The performances are well beyond serviceable – I very much doubt we are likely to get another recording of these works soon, but it would take one of the top orchestras to make much more of this music. This is described as Volume 1. His list of works numbers 48, but there aren’t many orchestral pieces among them. The remaining ones are all higher opus numbers than the four here: Psalms for chorus and orchestra, an Adagio for cello or violin and orchestra and an Intermezzo, which is an orchestration by the composer of a movement from a piano sonata. Whether these are the contents of the next volume, only time will tell.